The story begins on April 18, 1943, as four boys - Thomas Willetts, Bob Farmer, Robert Hart and Fred Payne were out poaching in Hagley Woods, located near Wychbury Hill. It was wartime, and with rationing making food a little short, the boys supplemented their daily meals with animals caught in the woodlands. It was a regular exercise for the four friends, and the day was no different to any other. With dogs leading the way, the boys entered the woods in the hopes of returning home with a good catch of rabbits. However pickings were slim, and as the sun began to set they made their way home. Every now and then they would check the bird nests that they could see up in the branches, in the hopes of finding some eggs. Upon seeing a Blackbird leaving a Wych Elm, Bob Farmer climbed into the tree and found a nest containing four eggs. Farmer then encouraged the youngest of their group, Robert Hart, to climb another nearby Wych Elm to see if they could extend their luck. As Robert climbed up the tree, he glances down into a hollow, thinking it might be a good place for a bird to nest. As he did so, he noticed the white dome and eye sockets of a skull looking back out at him. Intrigued with his find, and thinking it was the remains of an animal, he hooked it out with a stick. Robert was aghast to see human teeth and strands of human hair attached to the now obvious human skull. He showed the other boys, before returning the skull to the hollow and they all very quickly made their way home. The boys decided they would not tell anybody about their find, as they had been on the land illegally (privately owned), and did not want to get into trouble. However, Tommy Willets cracked and told his parents the story. The next day, after having contacted the police, the boys met up with several constables and sergeants from both Hagley and other nearby towns, and showed them where they found the skull. Once the police were satisfied that it was indeed a human skull, the investigation got under way. A forensic examiner was sent out to the scene, and with the help of several assistant officers, they started to clear the tree away from the skeleton within. The hollow was too small to get at all the bones, so using axes the tree was methodically trimmed and cut to allow easier access. Professor Webster, the forensic examiner, first took a good look at the skull. He found that cloth had been wedged into the skulls mouth, and there and then declared it a murder case. Parts of the skeleton were missing, so the search was extended to the immediate area where parts were found in other, nearby Wych Elms. The most bizarre aspect was that the hand belonging to the skeleton was found dismembered, and buried at the base of the original tree. Webster concluded the victim had been placed into the tree feet first, soon after death and still warm, as rigor mortis would have made placing the victim into the hollow a very tough task. A green glass bottle was found along with the skeleton inside the hollow as were fragments of the clothing the victim, now determined to be female, had worn. Once the remains and artefacts had been taken back to his lab, Webster was able to conduct a much more thorough study. He determined the victim’s age to be about 35, and that she had given birth at least once. Death had occurred approximately 18 months before the body was discovered (making it sometime in late October 1941), and the cloth in her mouth was taffeta. The victim had a gold wedding ring, a plain cloth skirt, blue crepe soled shoes, peach coloured taffeta under skirt and a blue striped cardigan. She had brown, chin length hair and a noticeable irregularity in the teeth of her lower jaw. The police had many clues to start their investigation in identifying the body. They put out a call to the public, to contact them if they recognised the clothing the victim had worn. Dentists were called to obtain records relevant to the victim’s teeth irregularities, and manufacturers of shoes were contacted in regards to the shoes. The police were confident that soon an identification would be made. Unfortunately, it was not to be, and the media began to report it as the 'Tree Riddle Murder'. Theories stated that she was a German Spy, and having been caught by the Home Guard, had been quickly dispatched and left in the tree - or that she died in a lovers tryst, jealousy having caused her demise. In 1944 the first of the graffiti started to appear. On a wall in Old Hill the words, "Who put luebella in the witch elm" appeared. 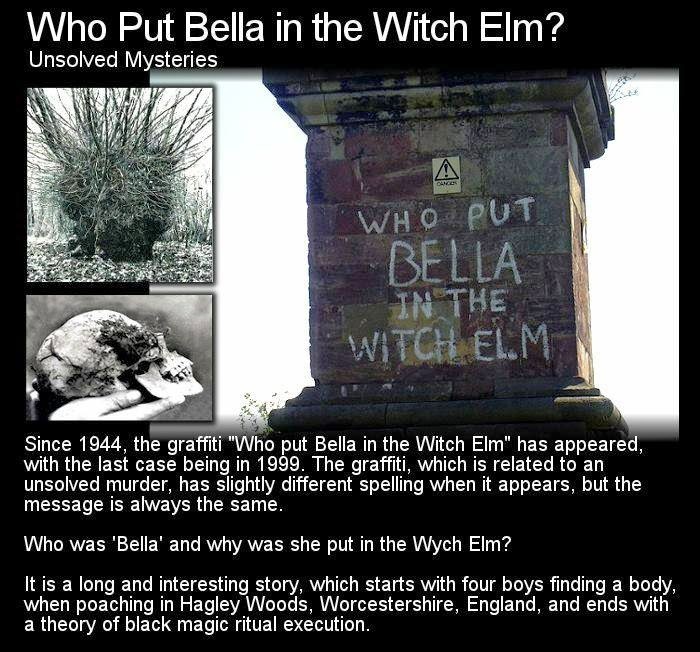 Soon graffiti turned up in another street reading, "Who put Bella down the Wych Elm – Hagley Wood". No question mark, written in the same hand, and almost a rather simple, but puzzling statement. It was theorised that whoever wrote the graffiti knew the identity of the victim, the first spelling of the name, an older style spelling, giving the hint of a personal insight. Soon people began to come forward with their own ideas on what took place... many in the area believing a cult was in operation, and that the murder was a black magic execution. This theory was put forward by Professor Margaret Murray of University College, London. After studying the case notes, and having spent years looking into the occult and dark religion/beliefs, she determined the removal and burial of the hand was part of an execution. The name Bella, being derived from Belladonna, and Wych-hazel both being related to several occult practices. A late day in October for the murder to take place was also relevant to this theory. Then of course there were the rumours of a black coven operating out of Hagley Woods. The idea of a punishment, rather than the body just being hidden in the Wych Elm, was given more credence when it was later revealed that the Wych Elm was only about 6 feet tall, the rest having broken off sometime in its life. The hollow the body was found only approximately 4 feet off the ground. Had someone intended to hide the body, surely they would have buried it in the soft soil. Had 'Bella' been punished for crimes against a group practising dark rituals? The remains were never buried and have since gone missing. Photo: The 1999 Graffito on the Wychbury Obelisk. Inset: Upper, the 'Wych Elm' Tree Bella was found. Lower, Bellas Skull.